Light and time may not be endangered species but we are still always losing them. It is not often I post things to my stream that were not taken by me, but this is one occasion. Simply, this is a glass negative found across the street at the Salvation Army. If I had to guess I would say it is probably a bit over 100 years old, considering that was the era when glass plates were being shot. Say the 1890's. Amazing huh? So at about 3 pm today I found myself holding a piece of glass with an image of three gentlemen on it over 100 years old. But more importantly, I love photography. This really just sort of blows my mind. 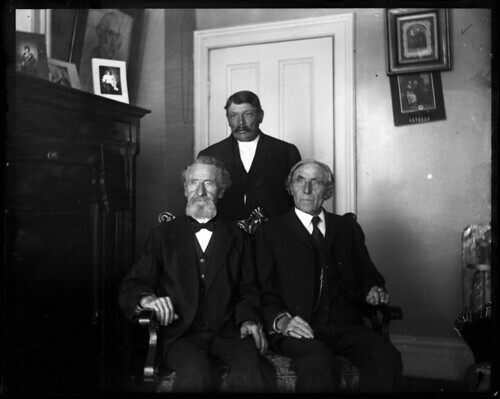 I start thinking about the fact that I am holding a once-sensitized piece of glass, that contains the imprint of light that bounced off of these three men over 100 years ago. In a sense it is almost a "light shadow" cast by them and captured on this glass. And here I am using a state of the art scanner to digitize that image and bring it on to the web. Once again, amazing. I don't want to make it seem like I am taking a dig at digital photography (digital imaging is why this image exists on the web right now) but this is a very big reason why I shoot film. The tangible nature. Being able to hold a piece of film that was struck by the very light that came off of the subject. Thinking that, that very same piece of film may one day be pulled from a box in someone's attic 80 years down the road, and that someone can hold it up to the light and see what I saw. They will even be able to still print it or scan it. But it is not the ability to still print it or scan it that so amazes me. It is the physical evidence that light has left behind on this particular piece of film, or paper, or glass. Digital doesn't have that. The sensor carries no trace of that light, rather it is converted into electronic bits and bytes. A digital copy. A replica of what that light cast. There is nothing tangible, nothing physical to hold unless a print is made, which so often it never is. And in some way this makes me deeply uneasy. I don't like thinking of the work of my life as being so intangible. It scares me in a sense and I never feel quite easy with digital images, despite the many amazing shots I have taken on digital cameras. And also despite how careful and redundant I am in backing those same images up. But it is not just my work. I think of all the pictures snapped every day. All those snap shots of sons and daughters. Mothers and grandmas. Beautiful sunsets and sunrises. And I think of what awful percentage of those images will have ceased to exist within ten years. Or twenty. Let alone a hundred years from now. I know that even film is not permanent, nothing is really. Not our negatives. Nor us. Or our planet, or even our universe. But nonetheless, I am pretty certain that I will not be able to pull any of my CDs of digital files out of a box in 100 years and still have them be usable. Nor any CF cards. My external drives won't last more than 10 years I bet. My digital files won't ever be anything more than bits and bytes. Sure I can print them, but those are just copies of copies. Better than nothing, but still far lacking. And so I shoot film, because I like to think each of those negatives carries the physical effect of light off of a beautiful waterfall striking it. Or the light bouncing off of my son Owen playing when he was 6 months old. And then again when he was 12 months old. Or even the very light that reflected off of an old friend no longer living. It is not so hard to hold a negative, or a plate like this, in your hand and feel like you are holding just a tiny shred of some past time itself. The last physical remainder of a moment long extinct, and that when I hold a negative in my hand, I am touching that light again. And that is one of the things that drives me to shoot film. That deep sense of not just recording light and time, but preserving it. If you have not browsed through it, the photo stream run by the Library of Congress is amazing. Really sit down and take your time taking it in. Don't just browse, really give yourself the time to look.